The iris is a beloved early bloomer in the perennial garden. In Greek mythology, Iris is a golden-winged messenger of the gods. As a link between heaven and earth, her symbol is the rainbow. As a flower, the iris is aptly named, boasting large, showy blooms that come in virtually every color of the rainbow. 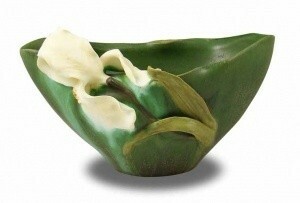 Here, delicately sculpted irises rest gently on the shoulder of an elongated oval bowl. The leaves continue around the back of the bowl. Approx. 4.50"h x 8"w.